Of any size - we are happy to advise you on the equipment of larger objects. From the meeting room to conference equipment. Pendant light Artemide Noto. 6 adjustable cylinders form an attractive, unique light, The red filter is shipped together with the luminaire. Order now. EA 219 Office revolving chair with high back on 5-star base with castors. 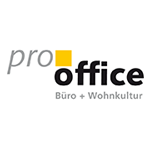 At the pro office online shop for office and design furniture. Order now.